Not an altogether terrible movie, though mainly for Stephen Lang ‘Langing’ it up, Isolation is maybe worthy of a rental, but even then I can see a movie of this ilk ending up on Spike in a year or two. The perfect vacation on a remote island in the Bahamas takes a sinister turn when a young couple (LUKE MABLEY, TRICIA HELFER) returns to their cabin to find it’s been ransacked — and their money and passports stolen. Turning to nearby couple Max (DOMINIC PURCELL) and Nina (MARIE AVGEROPOULOS) for help, they quickly realize that things are not what they seem, and that Max and Nina’s ulterior motives may prove to be more harmful than helpful. 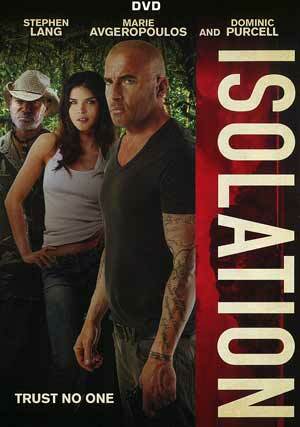 Lionsgate releases Isolation onto DVD presented with a 16×9 enhanced 2.35 widescreen aspect ratio and an English language Dolby Digital 5.1 track which is serviceable but lacks much depth. Overall, not an altogether terrible movie, though mainly for Stephen Lang ‘Langing’ it up, Isolation is maybe worthy of a rental, but even then I can see a movie of this ilk ending up on Spike in a year or two. The DVD, at this time exclusive to Wal-Mart, has no bonus features and okay video/audio transfers.